In equation (4.5d) ^ is the equivalence ratio. The only positive term that adds to the available energy is the kinetic energy of the injected fuel. If the temperature of the fuel (in this case hydrogen) is scheduled so that the injected fuel velocity is equal to the flight speed, and the fuel injection angle is in the 6° to 10° range, then the injected fuel energy to air stream kinetic energy ratio is 0.0292^. For an equivalence ratio of six, this provides an energy addition of 17.5% of the air stream kinetic energy. So recovering normally discarded energy as thrust is as critical as burning fuel in the engine. This will be discussed further on in this chapter, when identifying the operational zone for Brayton cycle propulsion systems. Figure 4.4. Four representative ram/scramjet module configurations. For clarity the aircraft is compression side up, with the airflow from right to left. combustion time was 35 microseconds ±5 microseconds over the combustor gas speed range of 6,000 to 12,000 ft/s (1,828 to 3,658 m/s) [Swithenbank, 1984]. Figure 4.5. Four very different internal drags for the four module configurations. of the shock system to normal flow is as great as a physical wall. 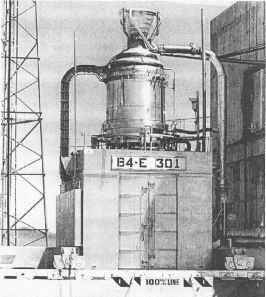 This concept was successfully tested in an RAE facility by Leonard Townend in 1966, and offers the lowest losses of any configuration. It was also a configuration developed at McDonnell Aircraft under the leadership of H.D. Altis [Czysz, 1999, Figure 15]. 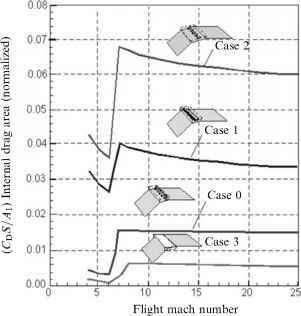 For each of these cases the internal drag area based on skin friction and shock wave drag (CDS) was determined and referenced to the engine module cowl area (CDS/A1)eng for each of the four engine module combustor configurations in Figure 4.4 as a function of flight Mach number. Note that as the supersonic combustor through-flow begins (that is, scramjet operation begins) there is a sharp increase in the internal drag. 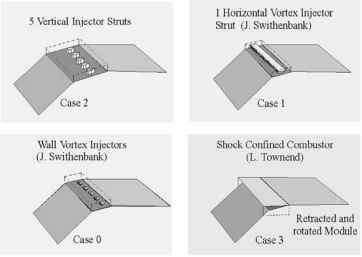 The stronger the shock waves and shock interference associated with the internal geometry, the sharper the drag rise.